Alliteration, assonance and rhyme form a tribute to brothers of every kind in the fourth book of this highly entertaining series. Whether they are in kilts or tights, sweep straw from stables or scrub with sponges, it seems no one can compare to the girl’s brother. There’s nothing boring about brothers. The girl’s brother has hairy paws, and pointy claws. He is a beast when it comes to creating entertainment. He’s someone new each time. Her brother knows how to play. He’s full of imagination, adventure and brave ideas. What more could a child ask for? This book depicts movement, laughter, and the enjoyment of life that is experienced by children. It exudes a sense of freedom and anticipation that will excite the reader and the listener. 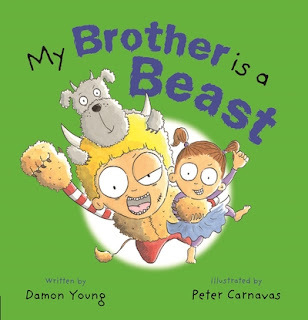 Peter Carnavas has translated every word of Damon Young’s stunning text with great insight and transformed every page into a delightful experience for young readers. Acts of companionship, inventiveness, play, sibling love and sharing, race through the book. It is a full-on celebration of the difference in people. My Brother is a Beast is a journey of discovery through words that bounce around the page and around the pictures in waves and lines and semi-circles. There are words to listen to that repeat sounds and end in rhyme. The rhythm is like music and singing coming from the pages, and a reflection of the same in the illustrations born from ink and watercolour. This is a vibrant book from cover to cover. It will be chosen time and again for couch sessions and before bed readings. The end pages are a reflection of the content. The bright green cover depicts the wide-eyed wonder and exhilaration experienced by the children. This book is something special and comes highly recommended.